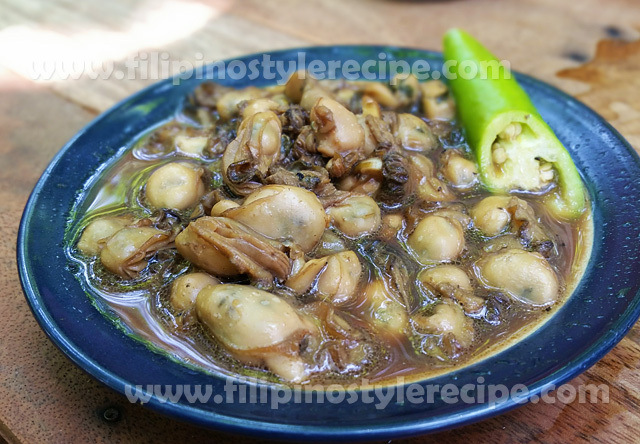 Filipino Style Recipe: Ginataang kuhol or suso(snail with coconut milk) is an exotic dish that you will find surprisingly delicious. 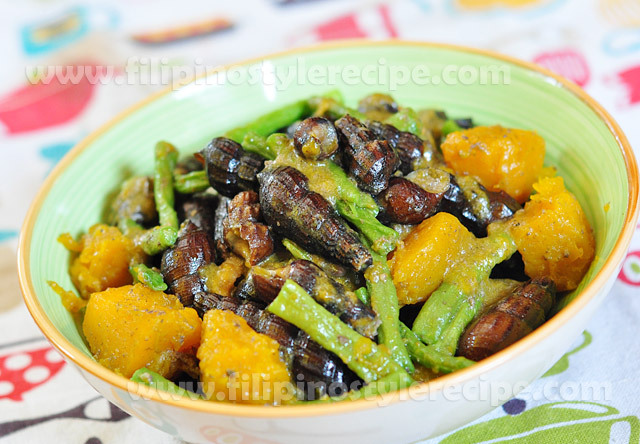 Snails cooked in coconut milk that you will enjoy the richness flavor together with vegetables. You can try this dish if your looking for a mouth-watering recipe that will surely agree to your taste. 1. To clean the snails, place the snails in a bowl with water and salt. set aside for a few hours. 2. Rub the shells in water to remove the residues and crack a small opening on the end of the snail. 1. Place the shredded coconut in a mixing bowl and pour in 2 cups of hot water. 3. Repeat the procedure, place the milk(2nd extract) to another bowl. 1. In a casserole, heat oil then saute garlic, onion and ginger. 2. Pour the coconut milk(2nd extract) then bring to boil over medium heat. 3. Add in the snails and bring to a boil once more until it almost absorbed. 4. Add the vegetables and green chili. 5. Add the coconut milk(1st extract) and bring to boil. Season with salt and pepper according to taste. 6. Continue cooking until the vegetables are tender but not overcooked. 7. Remove from heat. Serve hot. Enjoy! 1. In taking out the snail’s content from the shell, you can use a fork or a toothpick. 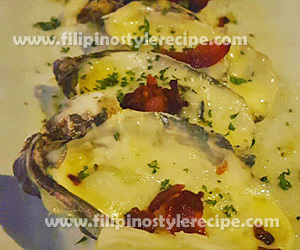 Filipino Style Recipe: Baked Bacon Oysters is another easy and simple dish made of fresh oysters, steamed until the shells open then baked together with bacon and cheese. 1. In a pan, cook bacon over medium heat until shrunk but not crisp. Drain on paper towel. 2. Chop bacon into pieces and tidbits. Set aside. 1. Rinse and brush oysters to remove dirt. 2. Steam oysters for 3-5 minutes or until shells open. 3. Remove top shells using a knife. 1. Arrange oysters in a baking pan, add bacon tidbits then cover each oyster with cheese. 2. Bake in a preheated oven over 300 degrees Fahrenheit for 20-30 minutes or until cheese is melted. 3. Transfer to serving plate, top with bacon pieces then sprinkle with parsley. 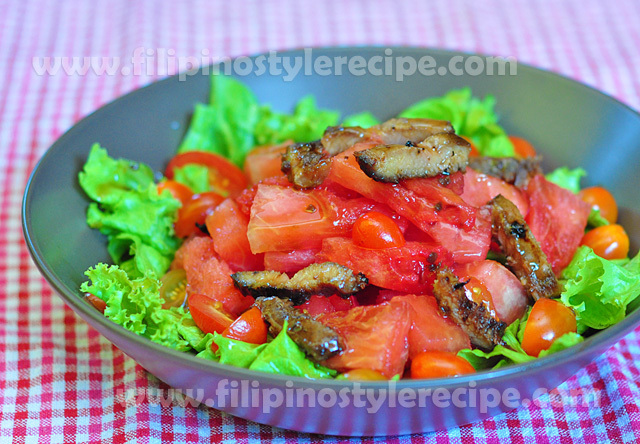 Filipino Style Recipe: Crispy pork kilawin is another popular spicy and sour appetizer that usually served as finger food(pulutan). Normally the pork meat(usually cheek and ears) comes boiled and grilled then chop into small pieces. Mix well with onions, vinegar, soy sauce, salt and pepper. 1. In a pot, Pour water, pork and salt. Bring to boil for 30-40 minutes or until soft and tender. 2. Drain and grill over hot charcoal until browned and crisp. 3. Let it cool then chopped into small pieces. 1. 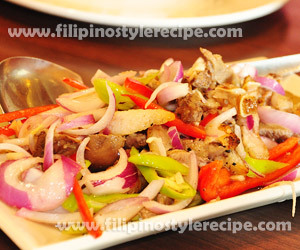 In a large bowl, place chopped pork and other ingredients. Toss to combine. 2. Serve! 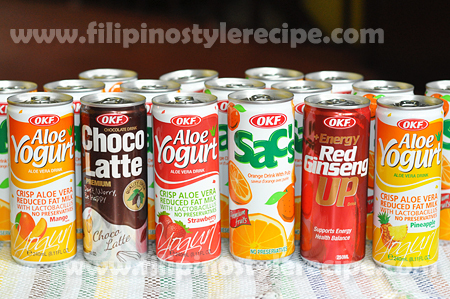 best for pulutan. 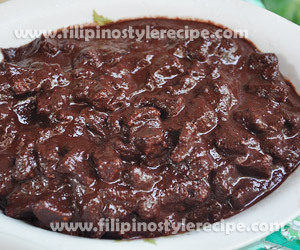 Filipino Style Recipe: Adobong Manok at Balunbalunan sa Gata or Chicken and Giblets Adobo with Coconut Milk is another variety of popular Filipino adobo. 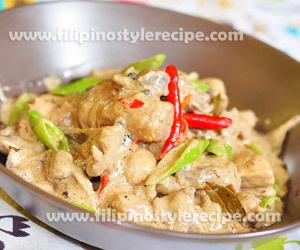 This dish has a creamy and spicy flavor similar to Bicol Express. 2. Add giblets and chicken then cover and simmer until tender. Add water if needed. 3. Add soy sauce, vinegar, peppercorns and bay leaves then simmer for 3 minutes. 4. Pour coconut milk and bring to boil. Keep stirring. 5. Add green and red chili. Adjust seasoning according to taste then simmer until thickens. 6. 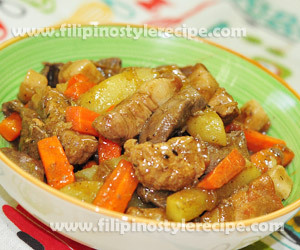 Transfer to serving plate then serve immediately together with steamed rice. 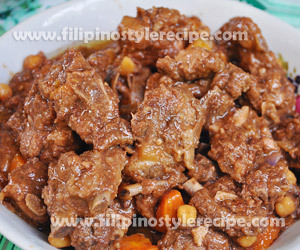 Filipino Style Recipe: Higadillo is a common Filipino stew made from pork meat and liver cook and simmer in a thicken sauce together with desired vegetables and ingredients. 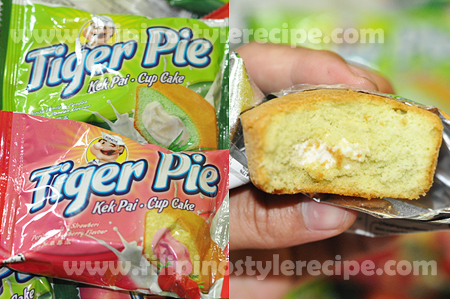 This can be served as main dish together with steamed rice. 1. In a skillet, heat oil then fry potatoes and carrots until light brown. Remove and set aside. 1. In a same skillet, reduce oil then saute garlic and onion. 2. Add pork then continue sauteing for 3 minutes. 3. Add pork liver and ginger powder then stir cook for another 3 minutes or until light brown. 4. Add soy sauce, lechon sauce and water then cover and simmer for 20 minutes or until meat is tender. Add more water if necessary. 5. Put back potatoes and carrots then add vinegar, bring to boil. 6. Adjust seasoning with salt and pepper according to taste then simmer until thickens. 7. Remove from heat then transfer to serving bowl. Serve immediately with steamed rice. 1. 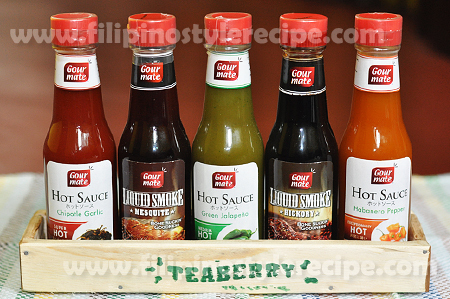 Alternative to lechon sauce, you may use live spread or breadcrumbs to thicken the sauce. 1. In a pan, heat oil and melt butter then saute garlic and onion. 2. Add bell pepper, corned beef, and potatoes then season with salt and pepper. 3. Stir cook for 3 minutes or until light brown. Set aside. 1. In a bowl, combine beaten eggs and milk then stir well. Set aside. 2. 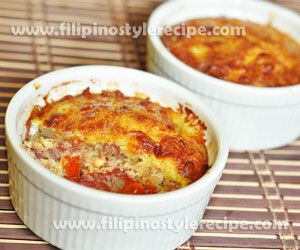 In a ramekins, arrange and press down corned beef-potatoes mixture then sprinkle with cheddar cheese. 3. Pour egg-milk mixture then sprinkle with mozzarella cheese. 1. Bake in a preheated oven over 300 degrees Fahrenheit for 15-20 minutes. 2. Remove from oven then serve immediately. 1. You may use quickmelt cheese as an alternative to Mozzarella cheese.